Friday’s post on green yarn got me thinking about my struggles with knitting things I’ll actually wear. When I first started knitting, I’d pick any old project and choose any old yarn that struck my fancy. I’ve been working slowly to get better at picking my projects and yarn deliberately so I’m building a wardrobe and collection of accessories that I’ll actually use and wear, but it has taken some time to rethink my approach to picking projects. The biggest issue with my old approach was how I chose colors. In my early days of knitting, I enjoyed the cozy, Hobbit-y feelings I associated with knitting. I knit my first scarf while watching Lord of the Rings, and you can see that in my color choices. I picked a lot of deep, rich yarn colors. They just looked right to me in the skein, and I have to say that they still do. As my interest expanded, I continued to pick those colors. My logic was that knitting takes a long time so I should knit in sophisticated colors that I would want to wear even when I was older. The only problem? I didn’t wear those colors. I still don’t wear those colors very often. 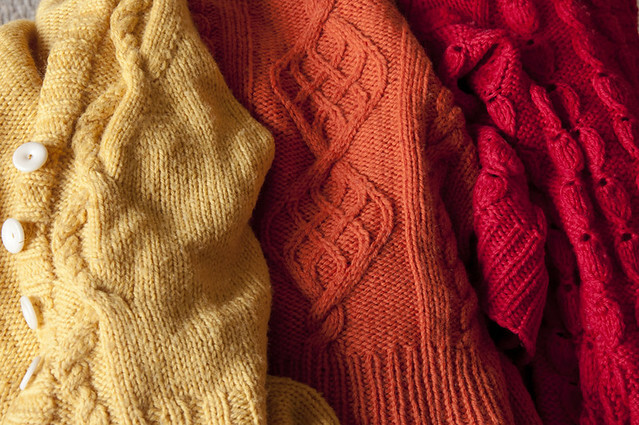 I wear red, orange and yellow; above are my three most-worn sweaters. It’s become a running joke in my office that if we’re choosing colors for something, like stickers to flag pictures we like when assemble mood boards, I automatically get handed the orange stickers without being asked. I like loud flashy colors, and I wear loud flashy colors. You would think that would make yarn shopping easy for me, that I would automatically be drawn to those colors in yarn form, but that’s usually not the case. If I were to pick a sweater, I would choose the bright flashy shade. But as a ball of yarn? The deeper jewel tones would catch my eye first. That makes impulse shopping difficult, and I’ve had to train myself to pick colors that go with my wardrobe. Frequently that means that I choose the color I’m looking for before I ever set foot into the yarn store. Hiding in my wardrobe, I already have a huge collection of colors that flatter me that I’m confident I’ll actually wear so it’s my best resource for choosing yarn colors. I try to look at my wardrobe and evaluate what colors I’d like to wear more or find complementary colors that are missing. With that information, I can go off to buy yarn, confident that I’m on the right track. I once brought a shoe into my local yarn store to find yarn that matched it to knit my cardigan that’s above, and I wear the one below all of the time because that shade of blue goes well with orange. It took me months to find the perfect mint green that I knew would go with some of my floral dresses, but this system works well for me. Figuring out what is missing from my wardrobe or simply what would complement the colors already in it has been key in building a collection of knits that I actually wear. 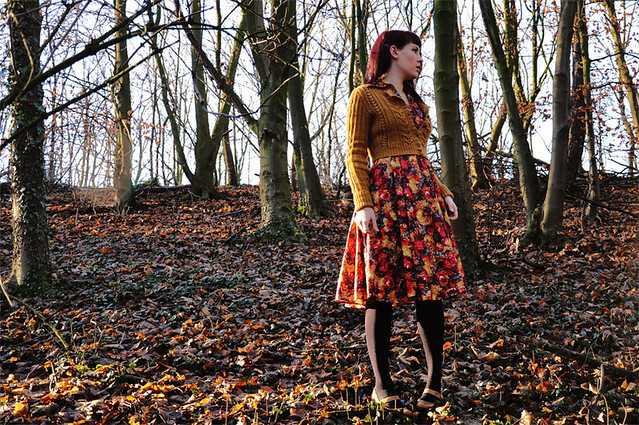 Do you wear your knits as often as you would like? How do you pick out colors to use? 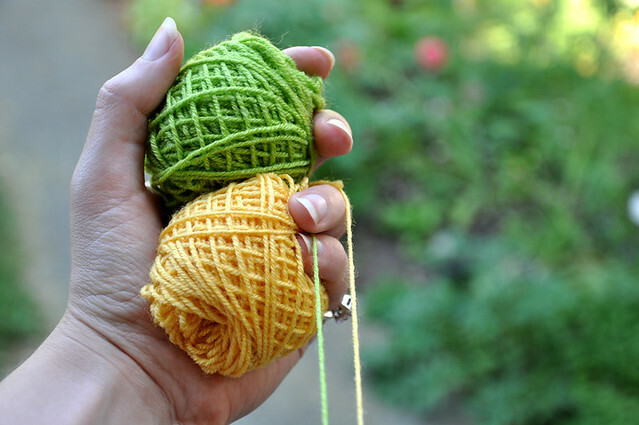 Are you attracted to the same yarn colors as clothing colors? I love that you just used “Hobbit-y” as a description lol! You’re a girl after my own heart. I’m just getting into knitting, as you know, so it’s been extra hard for me to shop for yarn and see it as a completed project instead of just “oooo pretty yarn!!”. As of right now, most of the yarn I own is just pretty yarn and not a planned project. I don’t have the skill to make sweaters yet, but when I do I’ll definitely take your advice and plan accordingly 🙂 I’m hoping to make a sweater vest in time for Fall! Maybe in a mustard yellow? Mustard yellow goes with a surprising number of things! I actually knit my mustard yellow sweater when I was trying to transition away from the Hobbit colors into the brighter stuff because it fell into both categories. When I first started knitting I was always attracted to the jewel colours, purple and teal, which were pretty much the only colours I had in my wardrobe. When I say they were the only colours, what I mean is that most of my wardrobe is in greys and black. I have learnt to buy brighter coloured yarns that will liven up my wardrobe because bright colours suit me, I’m just scared to buy them in clothing shops. So now I wear orange and mustard and hot pink. My accessories are livening up and I hope my next sweater quantity of yarn I buy will be nice and bright too. That way I will have some colour in my outfits! I love bright colors as well. I find that I keep returning to oranges and greens for my sweaters. I do pick colors that work with my wardrobe, but I think I probably need to branch out and occasionally knit with a neutral or something – I have so many knit items in rich, bright colors, and occasionally it would be nice to pick a color to blend in a bit more. Neutrals are also what’s missing from my hand knit sweater collection. I have one grey sweater that gets worn all of the time, and I’m working on a cream one now, but the brightly colored sweaters out number the neutrals. What an excellent post! I’ve just started to realize that I need to think about my yarn choices more and not just pick something that looks nice as yarn. 🙂 I’m almost done knitting a sweater now and I’m realizing that I probably won’t wear it that often because of my yarn choice. The yarn is just too busy and I can’t think of anything it will go with, but it was a pretty quick knit and my first knitted sweater from a vintage pattern, so the learning experience makes it worthwhile too. I’m okay with this one, but I definitely want to plan things out to fit my wardrobe on the next one! Thanks for the insightful post! I’ve also come to a point where I feel that I need to be more picky with the projects and the yarn I choose to go on with – it’s only frustrating to realize that you’re not wearing items that you’ve put so many hours into! I’m mostly wearing brighter, flashy colors, and need to stop using colors without any strength. I’ve knitted three sweater since teaching myself to knit and the one I wear the most is the one made out of the cheapest yarn, Lion Brands Wool Ease. I think I’ve worn the other two two or three times. I’ve recently started picking my colors before buying the yarn too. At first, I would do the same thing. Just pick a project and start. But, then I realized I would spend my time on something that I hardly ever wore. So, I’m trying to pick colors and patterns that fit my style. 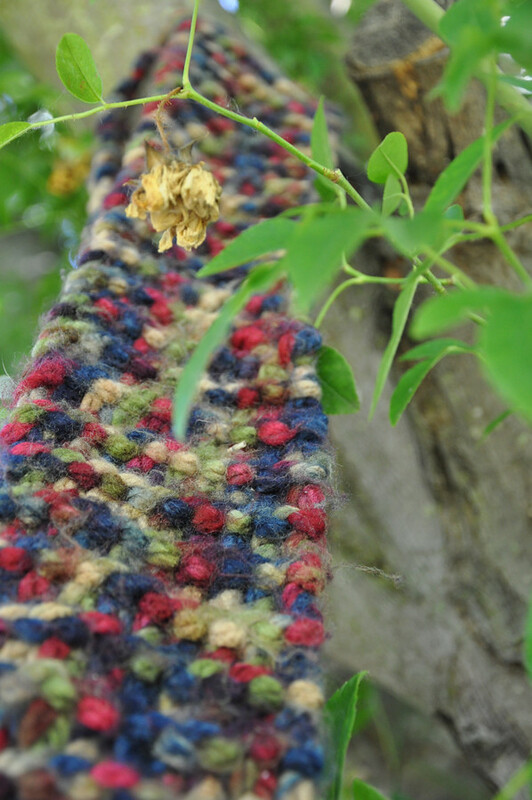 Both methods work because you end up with knits you can wear with your clothes. That’s the important thing! I always wear dark colours, black and brown. But when I pick out yarn I always pick out bright colours. Go figure! I think along the same lines I either see it in a colour right away or I think what I woukd wear wirh it thats in my wardrode and then choose a colour. My wardrobe consists of mostly neutral tones, so earlier in my knitting, I would buy more neutral toned yarn. Turns out that I like my hand knits to be the star of the show. So I allow myself to buy yarn that seems brighter than I am comfortable with. It usually knits up into something that fits my wardrobe well. And for extra loud colors that I wouldn’t feel comfortable wearing as a sweater I buy in sock quantities. I love loud socks. This was a rather thought provoking post for me. Thanks for sharing! I do this too! I love bright and crazy socks – they are the perfect place to enjoy yarn you know wouldn’t work in a more, er, public garment. I do the same thing you do: evaluate what my wardrobe needs. Sometimes when I go shopping, I’ll try on knitted sweaters to see what I like and look good in, then scroll through my queue for a pattern. I’m a jewel-tones or pastels girl because I’m trying to move out of all greys and into any color at all. My olive skin likes muted colors. Most of my sweaters are neutrals, but I like a color-pop here and there (especially now that I have three white sweaters!). It’s been quite a journey to this point, though, filled with many ugly, unflattering sweaters! I’ve actually been thinking about this a lot. When I first started knitting, I always picked pretty “safe” colors, but when I discovered hand-dyed, and then starting my own dyeing company, I really had to start thinking about color and what is and isn’t wearable. I’ve now come to the conclusion that I’m willing to be bolder with hand-knit garments than I am with store-bought clothes. I never would have bought this cardigan from a store. For some reason, because I made it, I completely love it’s loudness and quirkiness. 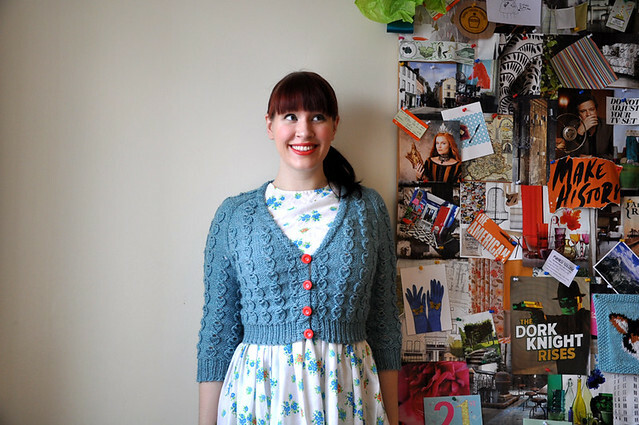 I’m in the process of making another variegated cardigan that I would never buy from a store but can’t wait to wear. I wonder why I feel so differently in terms of variegated garments when it’s handmade. Well, totally messed that link up. Here’s the cardigan. It was just missing an end bracket! I fixed it. I also knit things that I might not buy in a store. There’s just something different about clothing you make yourself. It is funny, but I do the opposite, Andy! When I buy sweaters I tend to buy greys. I love the greys and natural sheep colours! But when I plan sweaters the painter in me gets distracted by beautiful bright colours. Just like a crow. Awwrk. I have to learn to reign myself in and make some basics instead of constantly going for the colours I love but don’t always want to wear. I figure if I can make a few basics, then I can keep going crazy with the colours! Palette – all about the desaturated teals and mustards lately. oh, I really struggle with this. For the longest time I was just knitting things in colours different form what I had knitted in the past, as though having the most variety was the goal, but then the simple stuff is the stuff I wear the most. I know just what you mean! I have a terrible habit of walking into a yarn store with a pattern in mind and just allowing myself to go: ‘oh pretty!’. This post is so timely, as I have just been kicking myself for the fact that I have currently on the go: One green dress, one green cardigan and one green sock. (Ignore for the moment that I should have two green socks!). And I don’t wear green! I am definitely going to consider this technique. I’m obsessed with picking the colours of my knits, I think it over for ages, and then try to find the EXACT shade, lol. It makes finding the right yarn hard! I read this blog post the day after buying yarn for a sweater that I will probably rarely wear. I would never buy a bright teal sweater, yet that is my favorite in yarn form? I’m glad I’m not the only one with this problem. I will try to keep it in mind on the next project!